The "A.M. Crunchbowl" is quick fast food hack to get when you want a breakfast bowl type of deal at Taco Bell and aren't looking for the tortilla or one-handed eating of the A.M. Crunchwrap. As the name I made up suggests, it's an A.M. Crunchwrap without the flour tortilla that gives the wrap its distinctive hexagon shape. So you get a hash brown patty topped with eggs, creamy jalapeno sauce, cheese, and bacon (or sausage if you like). You can try to get one by asking for asking for an A.M. Crunchwrap without the tortilla in a bowl. I say "try" because the cashier had to check with her manager if they could do it or not. The price is the same as the A.M. Crunchwrap, which is $2.89 in my area. In case you're wondering, since they can't put it into the grill-press, they melted the cheese in a mini broiler oven. 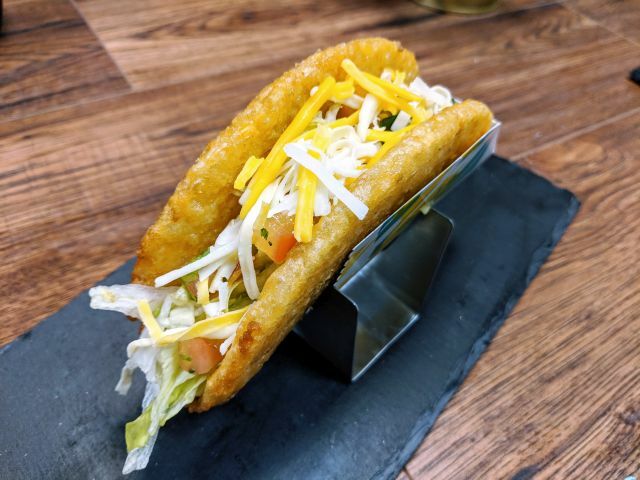 Until I tried one of these, I didn't realize just how much the flour tortilla blunts the flavors of each component inside the Crunchwrap. While the little bits of bacon don't ever get crispy, the smokiness comes on pretty strong without being too salty. The cheese formed a mild, melty layer over everything, while the hash brown offered bits of light crunch and greasy potato goodness. The creamy jalapeno sauce came across particularly well with a good amount of heat to go with a tangy creaminess. Unless you're eating an A.M Crunchwrap right there and then to maintain the thin, crisp layer from the grill, I'd go with the A.M. Crunchbowl for a similar, less carb-y version with more punch. If you want a bit more protein, a side of egg is listed on the Taco Bell website for 30 cents.